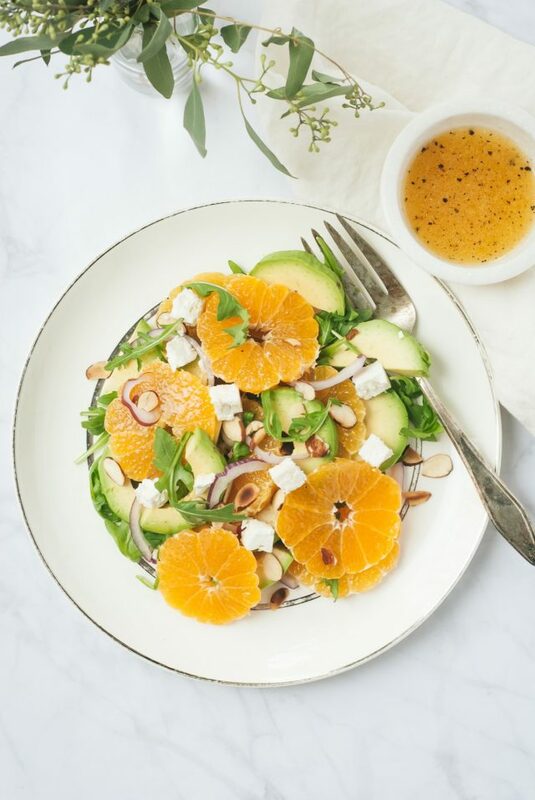 This simple but delicious salad showcases fresh Sumo Citrus mandarins, mixed in a light salad with a quick, healthy vinaigrette. This makes for a great side dish, or add a protein and make it a complete meal! I’m willing to bet I could hook you on these delicious Sumo Citrus mandarins with three short words- easy. to. peel. Yes, I could totally stop there because that fact alone makes these gems worth seeking out, but really, that’s just the beginning. The Sumo Citrus mandarins are so delicious that they apparently are often given as gifts in Japan, their country of origin. Now they are grown in California and available all across the US. I have found them at Whole Foods, Harris Teeter, and Kroger, but you guys have sent me messages on Instagram saying you have found them at Publix, Sprouts, Trader Joe’s, and The Fresh Market, too. 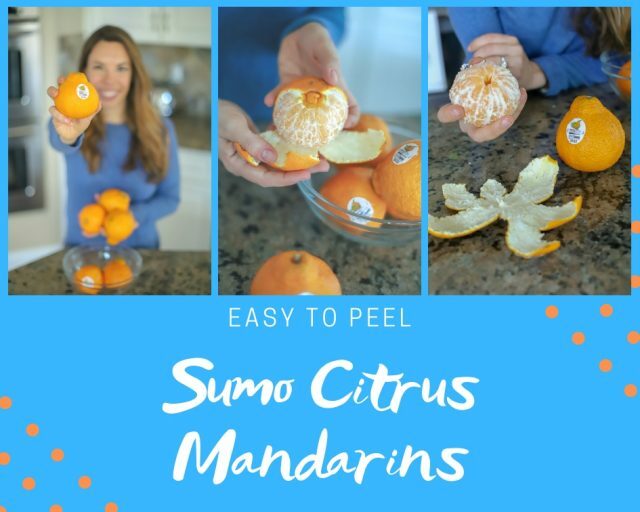 Find a list of stores that carry Sumo Citrus here, but also check in at your favorite local store and ask if they carry them! The sweet fruit is pretty distinct because they are large, bumpy and usually have a large knob on the top of the fruit, deemed “the top-knot.” However, similar to Honeycrisp apples or cherries, they are only available during their growing season, which is roughly January through April. Our household loves them. Due to the fact that they are uniquely difficult and expensive to grow and require special handling from seed to table, I initially started buying them only for myself. However, once the girls snagged a sample, they were hooked and now ask for them by name. I add them to their snack plates and they are always the first thing to go. 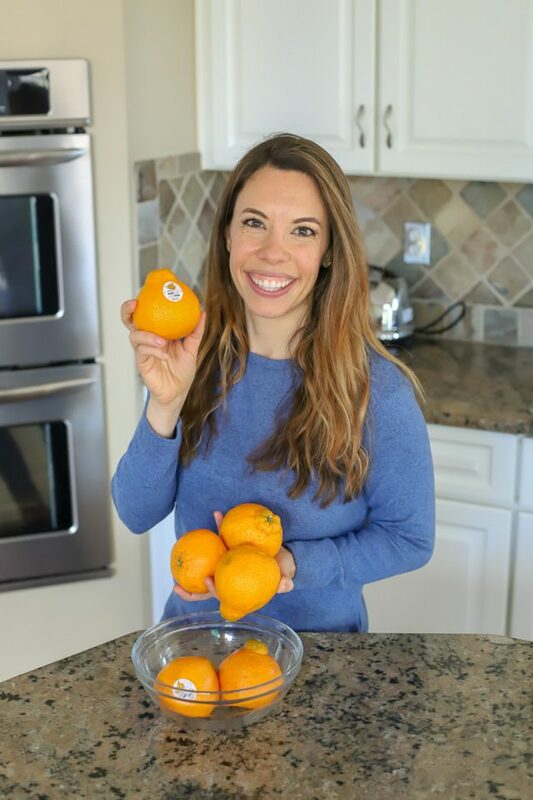 While these make fabulous on-the-go snacks because they are, again- so easy to peel, they also are such a unique and tasty fruit that I like to play around with them in main dishes, too. 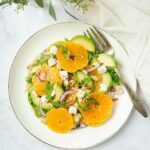 This recipe for Sumo Citrus Mandarin and Avocado Salad is a great way to serve them up. The light vinaigrette doesn’t overpower and allows the fruit to shine. 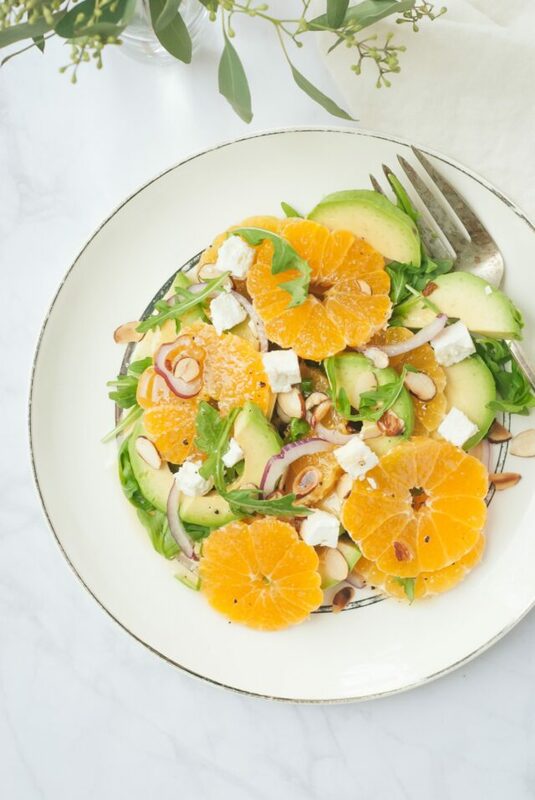 Add in the crunch of toasted sliced almonds, the tang of sliced red onions, and slices of buttery avocado and you have yourself one heck of a winter salad. I can’t wait to hear what you think of this one! But hurry; they are only around for a couple months! Combine mandarin juice, olive oil, honey, vinegar, garlic, salt, and pepper in a bowl or lidded jar. Stir with a whisk (or shake lidded jar) to combine. Set aside. Layer together mandarin slices, avocado slices, and arugula. Top with almonds, feta cheese, and red onion rings. Drizzle salad with vinaigrette. Serve immediately or chill in fridge until ready to serve. 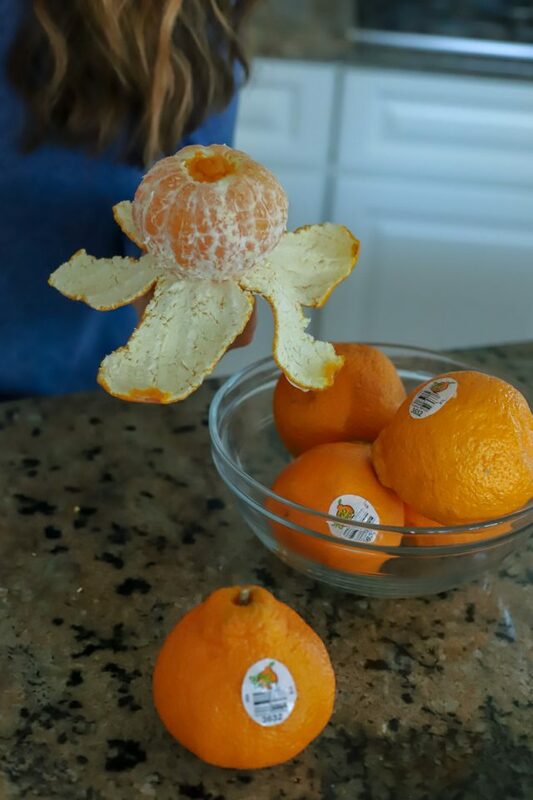 This post is brought to you in part by my partnership with Sumo Citrus.